Acer Canada announced today that its latest business-class notebook is now available in Canada. The TravelMate P243 has been on sale in the U.S. since the middle of August and is now shipping in Canada. It caters to the business market with Intel’s Ivy Bridge Core i5 processors, 4 GB of memory, and a 14-inch backlit LED screen. The laptop is an affordable option for businesses that need decent computing power for their applications. Loaded with the Core i5 processor, pricing begins at $699, or go with the less powerful Core i3 processor to start pricing at $599. The Acer TravelMate P243 is now for sale in Canada. There’s a couple extra frills beyond your standard laptop hardware on this model. One is a spill resistant keyboard, so you can fearlessly drink coffee while you’re working. Another is Wireless Display (WiDi) technology, allowing you to connect to another compatible HD screen without cords. 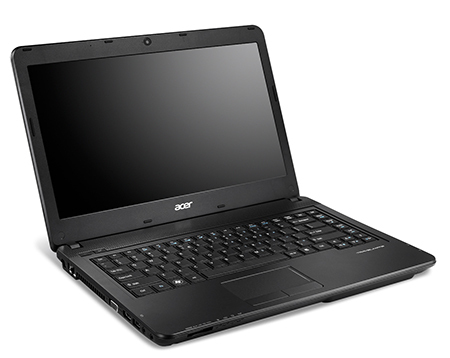 Acer includes its own suite of business software on the laptop. Those programs give users options to conduct tasks such as videoconferencing, file backup, and manage IT policies for the machine. At a time when many PC makers are revealing their hardware built around Windows 8, a new Windows 7 PC can seem like a bit boring. But many small firms have only recently migrated to Windows 7, or are still on their way there. So this is a better fit into their current IT eco-systems. Plus, Microsoft is offering to upgrade anyone who buys a Windows 7 PC between June 2, 2012 and Jan. 31, 2013 an upgrade to Windows 8 for a price of $14.99.